I was asked to put all 25 C# videos on one page with a description of each video, so I thought I would. I covered just about everything you’d ever want to learn about C# in this series. I cover the core language, OOP, Generics, LINQ, Threads, File I/O, Serialization, WPF, XAML, Document API, Databases and even make a full Paint application. A link to all the code from every video follows the video below with a description. If you like tutorials like this, consider donating $1, or simply turn off Ad Blocker on my videos. Either helps me continue to make free tutorials. C# Tutorial : We start by covering how to install Visual Studio and Xamarin. Then we look at Namespaces, Main, Input, Output, Loops, Command Line Arguments, Arrays, Data Types, DateTime, TimeSpan, BigInteger, Formatting, Strings, String Functions, Functions and much more. C# Tutorial 2 : In this part of my C# tutorial I’ll cover Implicit Typing, Casting, For, For Each and Arrays and StringBuilder in vast detail. The idea for this series is to cover even more then you’ll find in a normal book so that it can act as a video API for C#. After I get passed the basics I’ll then cover most everything. C# Tutorial 3 : In this part of my C# tutorial we’ll cover If, Else, Else If, Relational Operators, Logical Operators, Ternary Operator, Switch, Break, Continue, Goto, While Do While, Convert, Try, Catch, Finally and Exception Handling. C# Tutorial 4 : In this part of my C# tutorial we’ll cover methods in detail. We’ll cover Pass by Value versus Pass by Reference, Out Parameter, Params, Named Parameters, Method Overloading, Enum and much more. C# Tutorial 5 : We start learning about object oriented programming in this part of my C# tutorial. We’ll cover Classes, Methods, Fields, Constructors, Static Classes, Methods and Fields, Structs and Nullable Types. I’m going to cover OOP over a few videos to make sure everyone completely understands everything. C# Tutorial 6 : In this part of my C# tutorial we cover public, private, protected, constants, read-only fields, constructors, setters, getters, properties and more on static. I’m taking my time to make sure everyone completely understands object oriented programming in C#. We are getting near the end of the basic syntax and will start doing fun stuff soon. C# Tutorial 7 : In this part of my C# Tutorial we learn about Inheritance, Aggregations, Virtual, Override, Inner Classes, New, Base, Polymorphism and much more. C# Tutorial 8 : In this part of my C# tutorial series we will make a fun little game. I’m going to show how to create 2 warriors that will fight to the death in a simulated battle. More complex video games follow many of the techniques we cover in this video. It also will show how awesome object oriented programming is in that it gives you the ability to model just about any real world object, or interaction. C# Tutorial 9 : In this part of my C# tutorial we’ll be covering Abstract Classes, Virtual Methods, Abstract Methods, Override, Base Classes, Is, As, Casting and more about Polymorphism. C# Tutorial 10 : In this part of my C# tutorial we’ll look at Interfaces using both a simple example and another that is rather complex. We’ll also look at Abstract Methods, Inheriting an Interface, How to Create Flexible Designs, and the Command Design Pattern. C# Tutorial 11 : In this part of my C# tutorial we’ll explore many collections available with C#. We’ll look at ArrayLists, Dictionaries, Queues, and Stacks. We’ll test out most every function available with them. C# Tutorial 12 : This tutorial will focus on Generic Collections, Generic Methods, Generic Structs, and more on Delegates. We are getting near the end and so we are covering some of the really cool things C# can do. C# Tutorial 13 : This time I’ll cover multiple functions you can use to work with lists of data including Lambda, Where, ToList, Select, Zip, Aggregate and Average. These tools are extremely powerful and they help you solve extremely complex problems easily. C# Tutorial 14 : I cover a bunch of cool things you can do with C# in this tutorial. We’ll learn about IEnumerable, Indexer, Enumerator, Operator Overloading, Custom Casting, Anonymous Types and more. C# Tutorial 15 : In this video I’ll cover LINQ. Language Integrated Query (LINQ) provides many tools for working with data. LINQ is similar to SQL, but it can work with data aside from databases. I’ll cover From, Where, Orderby, Select, In, Inner Joins, Group Inner Join, Equals and using LINQ with multiple different collections. C# Tutorial 16 : In this part of my C# tutorial I’ll cover threads in depth. With threads you can execute multiple pieces of code that share resources and data without corrupting it. I cover a simple thread example, sleep, a more advanced with lock, Priority, and how to pass data to a thread. C# Tutorial 17 : This part of my C# tutorial is based completely on File I/O. We’ll learn how to Mess with Directories, Use File to Read and Write to Files, Get File Info, Use FileStream, Use StreamWriter, Use BinaryWriter & BinaryReader, and much more. 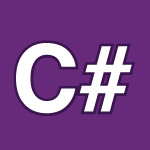 C# Tutorial 18 : This part of my C# tutorial is all about serialization. With serialization you can store the state of an object in a file stream, pass it to a remote network and more. We’ll store data using BinaryFormatter, XmlSerializer and so much more. C# Tutorial 19 : This is the 1st of many videos about designing GUI interfaces with WPF and XAML. Windows Presentation Foundation (WPF) is used to create graphical user interfaces. Using XAML eXtensible Application Markup Language you can create the UI using XML like tags. C# Tutorial 20 : In this part of my C# tutorial we’ll continue learning about WPF and XAML. We’ll cover the MenuBars, Assigning Shortcuts, Grid Layout, ScrollViewer, DockPanel, Changing Fonts, the OpenFileDialog, the SaveFileDialog and a whole lot more. C# Tutorial 21 : In this part of my WPF tutorial I’ll cover how to do a ton of things with toolbars. We’ll Create the Toolbar, Add Icons, Open / Save Files, Use Shortcuts, Copy / Cut / Paste, Change Fonts in Comboboxes and more. C# Tutorial 22 : In this part of my C# tutorial I cover Tabs, Calendars, InkCanvas, How to Make a Paint App, StackPanels, Toolbars and a whole lot more. C# Tutorial 23 : In this part of my C# tutorial I will be covering the Document API. We’ll use the Document API layout managers to work with formatted documents using the XML Paper Specification (XPS). C# Tutorial 24 : In this part of my C# video tutorial I show how to make a Paint App, and then we look at Drawing Lines, Ellipses, and Rectangles using Canvas. We’ll be using System.Windows.Shapes in this tutorial. They are great to work with because they respond to events just like other WPF components. C# Tutorial 25 : This C# Tutorial is going to cover a lot in a short video. I’ll set up the newest SQL Server and Visual Studio 2017. I’ll then explore Creating Tables, Using SSMS, App.config, Connecting to SQL Server with C# and a whole lot more.